When you have an unusual rash or skin discoloration, you frequently seek out pictures of skin disorders and skin diseases since using pictures is an easy away to self-diagnose potential problems. However, you should always follow up on your research with a visit to the dermatologist. Look through this slideshow to see nine skin disorders and learn a little about them. Cold sores or fever blisters, caused by the herpes simplex virus, are relatively harmless, although they can be painful and embarrassing. Symptoms will usually heal on their own in a few days, but over-the-counter creams, pills, and ointments are available to reduce pain and redness. If you're experiencing a cold sore for the first time or are unsure of whether or not your lesion is a cold sore, check with a physician. Vitiligo is a disorder in which pigment is destroyed, causing white patches to appear on various parts of the body. While the exact cause of the disorder is not known, many theories suggest it is a genetic autoimmune disease. Vitiligo isn't harmful or painful, although it can cause embarrassment and emotional distress. There is no cure, but some treatments can help disguise and possibly reverse the depigmentation. 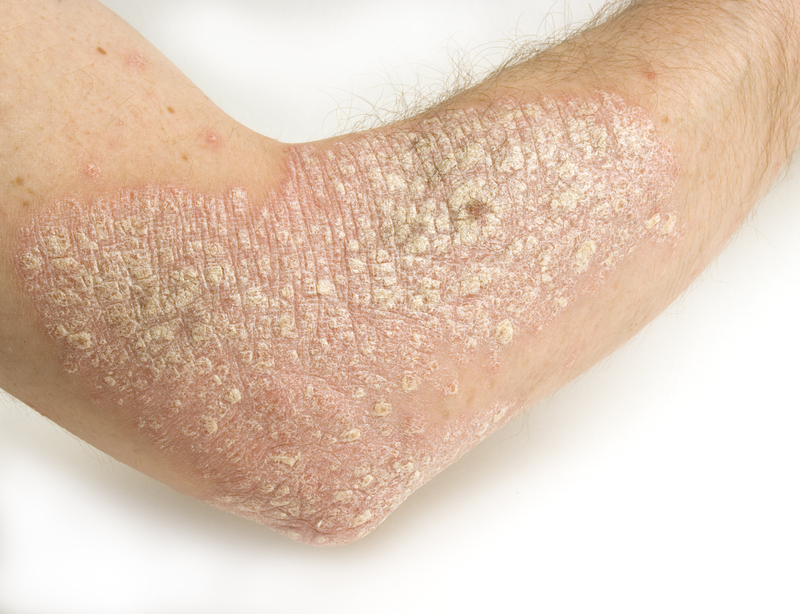 One of the more common skin disorders, psoriasis causes red, flaky, scaly skin. The most common type, plaque psoriasis, is characterized by patches of thickened red skin covered by silvery scales. Psoriasis may affect any part of the body, although it's most frequently seen on elbows and knees. While psoriasis isn't contagious, it may be inherited. There is no cure for psoriasis, but there are treatment options, so see your doctor if you have signs of the disorder. Ringworm is a raised, red, scaly infection caused by fungus. It is highly contagious and can spread from person to person and also from animals to people. You can treat a ringworm with over-the-counter antifungal medicines, but you should see a doctor for a ringworm that won't go away or one that comes back. Eczema is a form of dermatitis, or inflammation of the skin's outer layer. There are several different types of eczema and symptoms may vary depending on type and severity, but they often include redness, itchiness, scaling, and dryness. Eczema sometimes causes blisters that weep, ooze, or crust. Some types of eczema are temporary and are the result of an allergic reaction, while others are chronic. See your doctor for a diagnosis and possible treatment. Yeast rashes can appear anywhere on the body, but they are most common in skin folds, such as the groin, armpit, and under the breasts. A rash caused by yeast is usually red, flat, and itchy. These rashes can be treated with over-the-counter antifungal creams, but you should seek medical advice if the rash doesn't respond to treatment or if you develop a fever. People with weakened immune systems should speak to a doctor before self-treating a yeast skin rash. Redness across the cheeks, forehead, or nose is the most common and obvious symptom of rosacea, but it can also be accompanied by acne. Unless it affects the eyes, rosacea is harmless. Treatment often isn't needed, although many patients choose to use makeup to cover up the ruddiness. For many people with rosacea, certain triggers can cause the redness to flare up. Learning to recognize and avoid these triggers can help alleviate the symptoms. Triggers vary from person to person, but often include alcohol, stress, overheating, wind, extreme cold, and spicy foods. Shingles is caused by the same virus that causes chicken pox, so you're at risk if you've ever had chicken pox. Symptoms of shingles include small blisters accompanied by some or all of the following: burning, tingling, numbness, fever, chills, headache, joint pain, hearing loss, drooping eyelid, and stomach ache. If you believe you have shingles, see your doctor right away for treatment, especially if you have a weakened immune system. Most moles are harmless, but some do become cancerous. The most dangerous form of skin cancer is melanoma. See your doctor for any mole that changes or for any new moles, lumps, or nodules on the skin. You should check your moles periodically and be alert for the following: aysmmetry, irregular borders, uneven or irregular color, diameter larger than a pencil eraser, or growth. If your mole is firm to the touch or elevated above the surface of your skin, have it checked out by a dermatologist. Although most skin issues are more inconvenient than dangerous, some do require swift treatment. Your best bet is to see a doctor for any skin rash or disorder than concerns you.